Fire extinguishers are one of the easiest ways to stop the spread of small fires. Children, youths, adults, employees should all be trained on how to properly use a portable fire extinguisher. 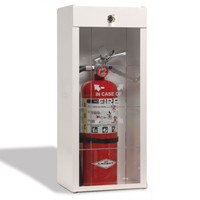 In San Diego we provide one of the largest selections and inventory of portable, fixed and wheeled unit fire extinguishers. There are many fire extinguisher companies in San Diego, but we provide the best fire extinguisher service in California. We offer a full range of fire extinguisher services to serve you best. Fire extinguishers may require service, maintenance, tests, inspections and annual tags. We refill, recharge, test, inspect, and maintain fire extinguishers in San Diego. Emergency lights may be required by Federal, State, OSHA, Health and Fire Codes in San Diego. 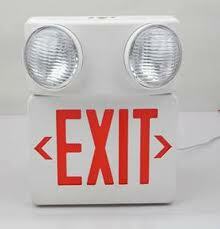 Emergency lighting may include exit signs, emergency overhead lights with battery back-up and secondary power supply, evacuation lights for hallways and large facilities. Our fire protection company installs, sales, services, repairs, offers parts and replacement of emergency light units, emergency lighting systems in San Diego. 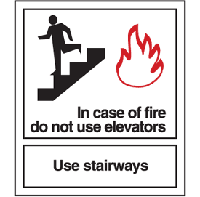 Emergency and safety signs may be required by Federal, State, OSHA, Health and Fire Codes in San Diego. 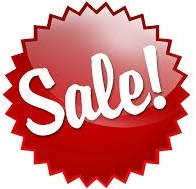 Emergency and safety signs may include emergency exit signs, evacuation signs, warning signs, instructional signs for commercial institutions to comply with OSHA, Federal and State Health and Fire Codes. Our fire safety company installs, sales, services, repairs, offers parts and replacement of emergency signs and safety signs in San Diego. We have classes available to teach you or your employees how to properly use fire extinguishers, including portable fire extinguishers, wheeled unit fire extinguisher training, and fixed unit fire extinguishers. We can help you comply with any required fire extinguisher training that may be required by OSHA, Federal, State, or Municipal fire codes in San Diego. Contact us today. Our fire extinguisher company provides fire extinguisher training for children, adults and employees. Learn how to protect yourself against the dangers of fire by using a fire extinguisher. Our facility can teach your employees how to properly use a fire extinguisher. Fire extinguisher training certificates are issued upon course completion. Additional information for fire protection systems in San Diego. Work with State Licensed Fire Protection Companies for Installations, Parts, Sales, Service, Repairs, Annuals, Tests, Inspections or Maintenance on Installed Fire Sprinklers, Fire Extinguishers, Fire Pumps, Hydrants, Fire Suppression or Fire Alarms Systems. When in doubt contact your local Fire Marshal for answers to State & Municipal Fire Codes.